The Reggiane series of fighters - the Re.2000, Re.2001, Re.2002 and Re.2005 - were technically among the best Italian fighters designed during the Second World War. All the aircraft designed and produced were obviously based on the Seversky SEV-1 and P-35, unsurprising given that their designer Roberto Longhi had worked for Seversky during the period in which the SEV-1 was designed, before returning to Italy to take the position of Chief Designer at Reggiane. As a result, the Reggiane series of fighters were in many ways far in advance of those from other Italian companies. Unfortunately, the Re.2000 gained a bad reputation with its "wet" wing that continually leaked; despite the fact this was not used in any of the succeeding designs, the series suffered as a result, and was disliked by the leadership of the Regia Aeronautica, with the result that none were ever ordered in significant numbers. The Italian Air Force suffered throughout the war from the fact that the Italian aviation industry had been unable to develop a really powerful engine for use in fighters. Performance of Italian fighters did not meet international standards until the German Daimler-Benz engines were adopted, beginning with the DB601, which powered the Re.2001 among others. These first fighters powered by the DB601 were basically limited modifications of designs that had been initially powered by Italian radial engines. Following the success of these designs, the industry was ordered to develop fighters that would specifically be powered by the DB605, to take full advantage of this powerful engine. The Fiat G.55, Macchi C.205V and Re.2005 were the designs that came out of this process. Longhi began work on the Re.2005 Sagittario (Sagittarius, the Archer) in 1941, and completed the prototype in December 1941. This fighter differed considerably from its predecessors, with greater wingspan, and a longer, more finely-streamlined fuselage, as well as outwards-retracting landing gear which replaced the rearwards-retracting system used on the others. It also was more heavily armed, with an engine-mounted 20mm cannon, two wing-mounted 20mm cannon, and two fuselage-mounted 13.7mm machine guns. Unfortunately, the DB605 engine to power the prototype was lost by the Italian railroad system during delivery, and was only found some months later at a railroad station near Milan - this may have been the result of sabotage. First flight took place May 7, 1942, and resulted in a wheels-up landing that inflicted little damage. By July 1942, in the official trials at Guidonia, the Re.2005 recorded to maximum speed of 421.6 mph at 22,802 feet, making it the fastest Italian fighter of the war. Amazingly, by the end of 1942 only three prototypes and one static-test airframe had been ordered while the Reggiane factory stood nearly idle; this was due to the successful flights of the G.55 and C.205, which had both taken place the month before that of the Re.2005 - the loss of the engine had been a substantial setback. While these aircraft were now the subjects of extensive production contracts, Reggiane was setting up to deliver 16 "zero series" aircraft to demonstrate their capability. Finally, in February 1943, 18 pre-production and 750 production Sagittarios were ordered. While this was going on, the Luftwaffe had shown interest in testing the Re.2005, and had sent a specially-prepared DB605A and a VDM propeller to Reggiane, who mated these to the second prototype in April 1943. The German test pilot recorded a top speed of 447.4 mph at 23,950 feet, a performance superior to that of the P-51D, Spitfire XIV, and Bf-109G. Sixteen "zero series" pre-production aircraft were delivered in May 1943, powered by German DB605A engines. The 18 pre-production aircraft that commenced delivery that June were powered by the Fiat RA 1050 RC Tifone, the license-built version of the DB605, which was unfortunately as poor a copy of the DB605 as the previous Italian attempt with the DB601 had been. The German-engined aircraft demonstrated superior performance with their more-reliable engines. Eleven of the these 18 were taken by the Germans after the Armistice in September 1943 and re-engined with DB605As with VDM props before being flown to an uncertain fate in Germany. Ten of the "zero series" Re.2005s were delivered to 362nd Squadriglia of 22nd Gruppo in Naples in early June, 1943. On June 28, they were flown to Sigonella, Sicily, to oppose the Allied landings on the island. By the time they were withdrawn to the mainland four days later, only two of the Re.2005s were flyable. On July 31, 362nd Squadriglia received ten pre-production Re.2005s. By the time of the Armistice that September, only two Re.2005s were left, neither flyable. The squadron had recorded no victories during the period of its equipment with the new fighter. Squadron personnel burned to two survivors to prevent them falling into German hands. The Re.2005 is proof that the Italian aviation industry was capable of designing and producing fighters that were the equal if not the superior of any used by their opponents. Fortunately, the political-military leadership of fascism was so incompetent - as has ultimately been the case in every country that has taken the route of far right radicalism - that this achievement by the Italian aviation industry ended up meaning nothing. 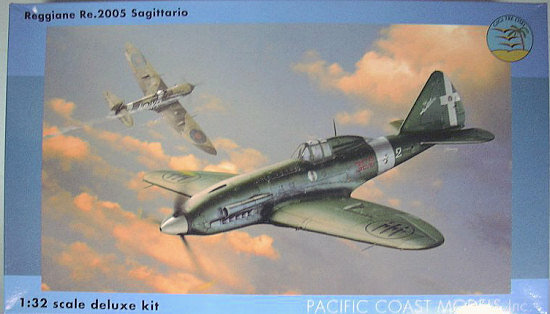 This kit, the fourth injection-molded 1/32 kit from Pacific Coast Models, is the first kit of the Re.2005 done in this scale in injection plastic. I am told that at least one vacuform was released in this scale several years ago, but have no further knowledge of it. Regardless, this kit is now definitive for the scale. 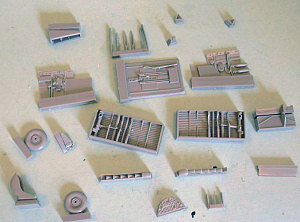 The kit has been produced for Pacific Coast Models, and the difference in the box between this kit produced by Sword and the Macchis done before for PCM by MPM is obvious even before taking the parts out of their resealable plastic bags and cutting them off the sprues for test-fitting. I was informed by Eric at PCM that the relationship with MPM was ended over that company’s decision to depart from the designs submitted by PCM for production of the Macchi C.202 and C.205 kits, which was why those kits had the faults they did. This kit has none of that. The plastic is shiny like that seen on recent Classic Airframes kits. 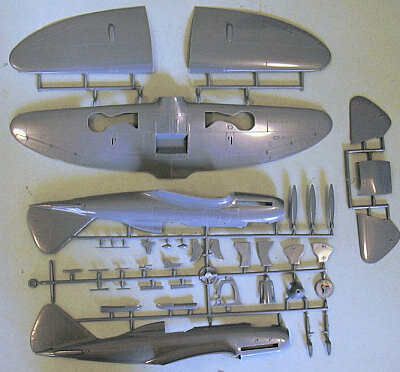 While the panel lines are a bit deeper than I would like - deeper than a Hasegawa kit, not as deep as a 21st Century Toys kit - I don’t think this will look bad under the proverbial “coat of paint.” The fabric detail of the control surfaces is very restrained and realistic. The canopy is in two parts and can be posed open, with the plastic being very clear if a modeler chose to close the canopy and emphasize the sleek lines of the airplane. When I took the main airframe parts off the sprues - which you will want to do with a razor saw since the sprue gates are just a bit thick - the fit was very good. A modeler will need to clean off the edges of the parts to get rid of some minor flash, and be particularly careful in mating the upper parts of the wing to the lower part, to insure that the wing will attach right to the fuselage. Failing to get this right would result in a model that had anhedral, rather than the straight-through wing of the original, which it is important to note did not have the standard dihedral one expects. When the wing attaches straight, it will be right. The resin for the nicely-detailed cockpit and the wheel wells is crisp and very effective in the amount of detail that is there. I like that it is almost all molded-in detail, which will simplify construction while resulting in a good-looking cockpit. 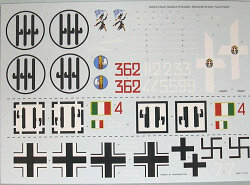 Decals are provided for five aircraft: two flown by the Regia Aeronautica, one flown by the Aviazione Della Republicca, and two by the Luftwaffe. With the addition of side numbers and serial numbers on the sheet, a modeler could do any of the Re.2005s that saw the light of day. The decals are up to the usual standard of excellence one finds with PCM kits. This Re.2005 kit is the essence of simplicity in production design. I don’t think this fact lessens the ultimate result in the least, and for the modeler whose time is limited (as mine has become recently), having a simple project that will obviously look good when completed is a Big Plus. Highly recommended. If you would like your product reviewed fairly and quickly by a site that has nearly 400,000 visitors a month, please contact me or see other details in the Note to Contributors.